The unexpected happened, so where do we go from here? How can Corbynism, or the new socialism, build on what it has achieved so far? The Tories are in an unenviable position, but we cannot rely on their rolling catastrophe and infighting to win the next election for us. 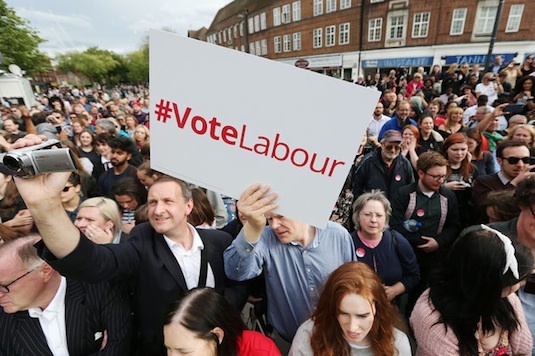 Besides, Labour is reborn as a social movement, it has shown that street politics can combine with electoral success. As such, while the party has Momentum, it needs to keep momentum too. For the Corbyn project to succeed and become the vehicle of the new class politics it needs to keep in mind three things: the transformation of the party, the winning of the next election, and the transformation of society. Luckily, the disarray the Tories are in gives us a moment to think and take stock as we consolidate our position. First things first, the party. And let's start at the top. At a stroke, the electorate have proved the naysayers in the parliamentary party completely wrong. In truth, for a number of MPs the electability argument merely offered cover for those opposed to Jeremy Corbyn's politics but didn't have the wherewithal, and in some cases the ability, to oppose him politically. Ultimately the outlook characteristic of Fabianism, of enlightened legislators reforming society to make it a better place while a semi-apathetic mass pays attention only to politics at election time, is at odds with the campaigning street politics and, if you like, the reformism "from below" of the "hard" Labour left. With the electoral viability of the leader proven, there now remains three Corbyn-sceptic strands. Those whose opposition was genuinely based on the pragmatics of vote catching and are now repenting publicly and, it would seem, sincerely. The second strand remain politically opposed but are prepared to reconcile themselves to the new order, for whatever reason. And then there are the hardened critics who can look forward to an inglorious stint as this Parliament's Simon Danczuks, though with waning press power and constituency parties set to take future reselections very seriously, one hopes their reach and frequency is weaker. While Jeremy got a standing ovation at last week's PLP meeting, and though the number of pro-Corbyn MPs have grown when it comes to filling out the front bench he should nevertheless appoint with an eye to two things (in addition to ability, of course): whether an appointee will be the source of future sabotage should things go south, and who will carry on building the left advance so far made. Understandably, Corbyn wants to bring in former rebels, but he can now do so from a position of strength. Therefore, making Owen Smith shadow Northern Ireland was a good move. As an oppositionist he is a spent force. He has been suitably contrite and is, from the point of view of Ulster politics, even-handed and experienced. Also, in the view of the diehards, he'd temper the pro-republican sympathies of Jeremy and John McDonnell. It also ticks the reaching out box. Additionally, there are calls to offer Ed Miliband something, preferably the environment. Here the same reasoning very much applies - assuming Ed fancies something, of course. However, when it comes to appointing from the second group of Corbyn-sceptics he has to be very careful. We've seen some whingeing from people who feel entitled to a position, which naturally rules them out. Much play has been made of Stephen Kinnock, Chuka Umunna and Yvette Cooper jockeying angling for a role too. And Jeremy would be mistaken to let them back. For Chuka, well, one wouldn't want to interrupt the interesting intellectual journey he's taking, and Yvette? Well. She talks about unity and conciliation now, but it's worth recalling she (and Chuka) had leadership bids on the runway before the electorate cratered the approaches. And there is her well-trodden disingenuousness to contend with. For all three, a front bench position keeps them in the spotlight while they play the long game and would, given half the chance, undo all that has been accomplished so far. I also don't think projecting a personnel management image is what the party needs right now, either. While treating with the PLP, there should be no let up in the transformation of the party. Key here is cementing the sovereignty of the membership, particularly over policy direction and selection and reselection. The Labour right are weakened, retreating from their already reduced circumstances prior to the election. A flood of new members have simultaneously poured into the party, the union tops have no choice but to be even more solidly behind Corbyn and, crucially, whole swathes of formally Corbyn-sceptic activists have switched as Jeremy has proven himself a winner. The election has also made activists out of many of the recent arrivals. Here, the new wave of left blogs married to social media savvy helped cohere Corbynism and got supporters out on the doors. There is nothing stopping them from repeating the trick where it comes to internal party matters. Hence in the next couple of years the advantages Corbynism has must be played to extend the left's control over the party machinery to ensure it cannot be used as a base for the right. Of course, the leadership and key left activists know this, and so do the right. If the latter want to make a comeback, they should have to make the political case for their ideas and approach instead of relying on bureaucratic chicanery and scaremongering to do it for them. As regards the Westminster game itself, I cannot recall in modern times when a party has been as paralysed as the Tories. Everything that could go wrong for them did as their incompetence and arrogance caught up with and helped them get found out. Labour then needs to think about how to make the most of this crisis and get the divisions in their parliamentary party to break out like a rash. There's some good advice from John McTernan(!) in this regard though, again, I don't think there's anything here the leadership doesn't already know. In addition, I would suggest the PLP collectively have a think about Private Members' Bills. If you're not au fait with procedure, backbenchers from all parties can bring forward proposals that go into a draw that then receive parliamentary time. Sometimes they're used as stunts to attack the party opposite, but at others it's usually an individual member's hobby horse and invariably gets defeated by indifference or a whipping operation by the government. There is a case therefore to use this session to coordinate entries to inflict maximum political damage and exacerbate them Tory divisions. As well as using Opposition Days, issues pertaining to care, the NHS, tax credits, fracking, on all these the Tory factions are at sixes and sevens. Some would balk at voting against the government on, say, lifting the public sector pay freeze but do so knowing their party and their would-be Prime Minister will take a reputation hit. In other words, the balance in Parliament and Tory disunity gives Labour an opportunity to effectively govern from the Opposition benches. At least at intervals. This is important not just because we have to demoralise the Tories, but because we've got to make serious inroads into their vote. Despite losing seats, the Tories captured 42% of the vote. And in the latest Survation poll, while Labour enjoy a three-point lead the Tory vote is stubbornly high. That is after the dementia tax, after the shambles, and even after the fall out from the Grenfell disaster. This apparent solidity doesn't surprise me. Under the conditions of a polarising electorate, theirs is a bloc in which traditional Tory supporters are pressed cheek by jowl with Scottish unionists, the bulk of UKIP's refugees, and a layer of Corbyn-sceptic Labour voters. The power of the traditional media, though waning, is helping to keep the bloc together with nationalist appeals to Brexit and scaremongering about what a new Labour government means. This is an old vote and one most unlikely to replace itself like-for-like. In the medium to long-term they could well be screwed, especially as they busy themselves toxifying their party to anyone under the age of 50. Hence why Dave and May were so keen on the boundary review. Nevertheless, we can't wait for demography to crank out the right result, we need to chip at that Tory edifice further - especially when you consider in a number of post-industrial towns and cities (like Stoke, like Mansfield) Labour went backwards. It goes without saying this requires continual campaigning, but on the basis of emphasising aspects of our manifesto that didn't get much of an airing during the election. Hammond spent last Sunday touring the studios and moaning about the lack of focus on the economy, where the Tories think they have a good story to tell. They don't, but let Labour start going hard on their dismal record, fairness at work and, crucially, on the protection of pensions - understandably an issue on the minds of older workers as employers carry on trimming their contributions here and there. Pressing for more time off work under the Patron Saints' bank holiday pledge is something that more socially conservative voters who switched to the Tories this time might like to hear more about - perhaps that's one for the aforementioned Private Members Bill? And on old people, speaking to and getting their attention requires more than bundling up care and the NHS and hoping it will work. Serious thought has to be given to what their concerns are. Labour has to be seen to listen. For example, pensioners are disproportionately dependent on public transport and buses in particular. While this was addressed in the manifesto it was always the trains that grabbed the headlines. There's an open goal here waiting for a ball to be kicked at it, and it opens a new route for Labour to start addressing community life and senses of security in an insecure world. There's a reason why older people are more susceptible to the scaremongering of the right, but it can be neutered. Lastly, there is that unique thing Jeremy's campaign and Labour's result brought to British politics: hope. Speaking for myself, I've only felt hope about the state of politics once before, and that was in 1992 when I was a teenage Tory. The Labour Party now has a rare opportunity to define what the future should look like, and not be afraid of saying what it should be. We've seen the experiences of Blair, Obama, and now Macron in France where hope is an empty signifier that invites supporters to project their own fantasies onto it. The result is bitter disappointment and right wing governments follow as constituencies are undermined and dispersed. Their hope is vapour, ours has substance. Policy does some of the leg work, but we need that vision thing. I hope John reconvenes his economic advisory council to draw back some of the best brains, but it shouldn't be limited to this. The Co-operative Party is too often Labour's forgotten affiliate, but their experience with shared ownership and cooperative economics should be heard by the leadership. Additionally, there is a case for a society advisory council that can assist in thinking through the general line of march and helping Labour align with the powerful dynamics that are transforming cultures, economies, and politics, including the party itself. There is much to be done but for the first time during my 25 years on the left, Labour has the strength, ambition, motivation, and capacity to do what needs to be done. There's a planet to save and a world to win, so let's do this. I was a Co op Bank customer until the management pharmaceutical and personal abuses cancelled out any credible ethical dimension. Do not use them as any sort of model for Corbynism. @James Semple: you're confusing the Co-op Bank and the Co-operative Party. Obviously an easy mistake to make. it looks dodgy to me as the spread of data points seem ill-defined, but being rusty of statistics I don't know if there's a statistical tool to define the validity of the straight lines that this method creates, or the significance of their angles. Leaving aside the questions of (a) how the "working class" is usefully defined these days, and (2) what's wrong with appealing to more educated younger and more ethnically diverse people, given that these are the directions in which the country is heading? I'm planning on having a look at that piece and giving it a going over if I have the time. "...the balance in Parliament and Tory disunity gives Labour an opportunity to effectively govern from the Opposition benches. At least at intervals." hopefully, this is so. the left needs to stop winning "moral" victories and start winning some actual victories. My favourite is for a new female deputy leader post to be created (Emily T?). Difficult to argue against the idea, and it would dilute big fat Tory-lite Tom Watson's power. Anonymous is sceptical about the graphs in a New Statesman article. As well as drawing a best fit straight line the author also shows R squared values. If anonymous looks up Coefficient of Determination in Wikipedia she will see it reflects how much of the data is explained by the line : 1 means all of it, 0 means none of it. One of the graphs has R2 =0.08, so not much correlation there. "My favourite is for a new female deputy leader post to be created (Emily T?). Difficult to argue against the idea"
Well... pretty easy to argue against Thornberry, which'd be a triumph of loyalty over competence. At least go with Rayner. @Lidl_Janus. No prob. Rayner would be a first class choice for those seeking to dilute the power of big fat Tory-lite Tom Watson. Really? Thats our number one priority. I dunno, that doesnt seem to be much of a vote winner to me. Nor does it make much strategic sense to do things that just might open up divides and create a handy diversion for the Tories. Call me old fashioned, but i'd rather see if Corbyn can continue his upturn in form and lead a PLP that looks, sounds and acts like a credible government in waiting. That might be a more useful way to bring more voters to our cause and help win the 60 odd seats we need. Lets not get deflected when we have a hopeless and very vulnerable government in our sights. Your concern trolling is becoming a bit obvious, Steve. I preferred it when you were a bit more plausible and subtle. Still, I suppose the election result came as much as a shock to you as it did to most people. Corbyn is now ahead of May as best PM - rejoice!